Nigel Foote is an Australian singer/songwriter who has won a number of awards for his work, including two Pater Awards and the Rudi Brandsma Award, plus many final placings in the Australian Songwriting Awards and Musicoz Awards. A fine guitarist, Nigel has also built a reputation as the composer of some beautiful tunes, passing on his knowledge of folk-blues guitar to a long line of students who have come to his door since 1983 to learn the secrets of fingerpicking. Nigel grew up in Sydney, in a home filled with laughter, music and candlelight. He played piano as a child and can remember his grandmother, Dorothy (one of the Fuller Sisters) singing Irish, Scottish and English folk songs in the garden. Perhaps Nigel’s “easy mastery of melody”, as Judy Small puts it, has come from hearing those beautiful tunes at such a young age, or perhaps it’s simply in his blood – but whatever the reason, Nigel's Celtic heritage gives his songs a melodic strength that places him amongst Australia’s most evocative songwriters. Nigel married Dawn Egan (a traditional folksinger) and moved to the Blue Mountains in 1983, where the couple found they were in demand for their atmospheric music, establishing themselves as full-time musicians and teachers of folk-guitar and harp. During the International Year of Peace (1986), Nigel released an anti-nuclear 'single' in association with Greenpeace. The record was well received in Germany but only gained modest airplay in Australia. However, both songs on the disc won songwriting awards – including a prestigious international Pater Award – critical acclaim that prompted Nigel to release his debut album, Dangerous Game, resulting in a second Pater Award. The music from that album is woven through the fabric of the Blue Mountains community, with songs such as 83 Ordinary People (The Granville Song), used in the music curriculum at the Blue Mountains Grammar School, and Dangerous Game – a song about the poet, Michael Dransfield – adopted by the Damien Trimmingham Foundation. In 1986 the Blue Mountains City Council invited Nigel to place his anti-nuclear record and lyrics in a Time Capsule – now buried at Echo Point – as part of the International Year of Peace celebrations, to be unearthed next time Haley’s Comet orbits the Earth in 2061. Nigel released his second album, Home By Dark, in 2006 – winning The Folk Award in 2006 and 2007 at the Blue Mountains Music Awards for songs from the album. In 2011, Nigel's song The Water Smoothes The Stones, was chosen for Macca's Top 100, a collection of songs selected from Ian McNamara's long-running ABC radio programme, Australia All Over. In 2012, Nigel formed a trio, No Real Job, with his son Martin Foote (guitar) and James Church (dobro). 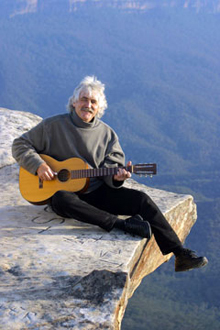 Since settling in the Blue Mountains, Nigel has always been involved with the folk-scene in one way or another – as a performer, event organiser, archiver, songwriter and guitar teacher. However, as a non-touring artist he is relatively unknown outside the Mountains – a man who stands in the wings, quietly weaving another thread in the tapestry of the Australian music scene. I am struck at both his easy mastery of melody and his keen perception of the detail of human relationships – beautifully crafted songs … wonderful musicianship … worth the wait! The great marriage of words and music is too often discarded for the lure of making quick money in today's lucrative music market. But if you are willing to explore further beyond the tease of commercialism, there are still artists in this world writing and performing works of a truly exceptional standard, songs that inspire and touch us, melodies that will echo through the years. Nigel Foote is one of these artists. As the water smoothes the stones, Time has honed Nigel Foote's songwriting skills ... a beguiling album … highly recommended! Nigel Foote’s long-awaited second album, Home By Dark, is exceptional... one of our finest musicians. In the style of Iron and Wine and the great Americana folk artists, Katoomba's own Nigel Foote is carving a spot for his own name in the wordsmith world that is the folk scene ... respectful of the past, yet always lyrically inventive, Home By Dark is beautiful, subtle and intimate. My first folk influence was my grandmother, Dorothy Fuller – one of the Fuller Sisters – so perhaps I'll begin my stroll down 'Folk Memory Lane' in 1955, with the sound of her voice floating up from the garden of the flat in Harbord, Sydney, where she and her husband Jack lived, having recently emigrated from England. But the traditional melodies that my grandmother sang were stronger than those found in classical music. They were so honest in their simplicity, so unpretentious in their structure that they connected on a more purely emotional level in a way that classical music – due to it's complexity – can rarely do. Not that I thought about it in those terms, as a child of, of course – I just knew that the songs my grandmother sang were a part of me. In 1961, I was thirteen and beginning to bumble my way through high school – I always struggled academically due to my dislexia – but singing in the school choir in St Andrews Cathedral, three mornings a week, made going to school worth it. How I loved the choir – gazing at the soft, shafted light that beamed through the stained glass windows as our boy-soprano voices soared through the cathedral. Now a teenager, I was totally hooked on the Top 40 Pop Charts on the radio, and made endless lists of "Bullet Performers", the position that songs entered the charts and how long they remained at Number One, if they made it that far. There was much more of a variety of music on the charts, back then, than there is today – even instrumentals were included. Occasionally a folk song by the Weavers or Burl Ives would receive airplay, and although I was into Pop music, the seeds my grandmother planted in me as a child were about to flower. The Folk Revival was stirring and I was lucky enough to be a teenager at that magic time – the 1960s! The following year, in 1962, I attended my first big concert and had one of life's 'lightbulb' moments, although it was more like a lightning strike! I saw the American folk trio, Peter, Paul & Mary at Rushcutters Bay Stadium in Sydney. We had good seats, close to the stage. I was smitten by the trio's stunning harmonies, fingerpicking guitar... and by Mary Travers – her wide, sensuous mouth and long platinum hair that flashed in the stage lights as she tossed her head from side to side, stirred new feelings for a boy in the shadowland. I left school in 1965 and bought my first guitar – the instrument has been my constant companion ever since – and I can feel my grandmother smile every time I'm fortunate enough to write a good melody!